15U black girls were hoping to finish off a successful season with a great showing at the Provincials. Friday started off with a convincing win against Forest City Blue giving up only 22 points over the two sets. The Hurricanes were up next and the girls came out a little flat, although they came back strong they came up short in the first set losing 23-25. The second set was a different story where they won 25-15. The third set went back and forth but we pulled it out winning 16-14. Titans Dynasty was our last match of the day and although the first set was close we won both sets against 23 and 11 points. Saturday started against the Mavericks. We have had their number for two years and this day wouldn’t be any different. We easily won 25-14 and 25-16. Next up was the Blaze and it was a back and forth battle for the entire first set. Unfortunately we couldn’t finish them off and lost 24-26. Blaze carried their momentum into the second set and we lost 19-25 giving us our first lose of the tournament. Our toughest opponent of the season from Aurora were up next. We haven’t beat them yet this year but the girls came out strong and played a solid first set. Unfortunately we came up a few points short losing 23-25. The second set had Storm carrying their momentum and taking the set 25-11. Sunday had us against the Predators for our first match of the day. The girls started out well but then the Predators started to roll and coupled with a few calls that went up against them we lost the first set 19-25. The second set was unfortunately much of the same and although we played a lot better we came up short 21-25. Although understandably disappointed the girls gave it their all and not for a few crucial points throughout the weekend the outcome could have been different. With the 2010 Vancouver Olympics coming to a close the 15U Black girls were searching for a podium finish of their own. The final Premier 15U tournament was held in Burlington on February 27th and just like Canada’s Olympic teams DA played to their personal best. The day started against the Rapids and within 15 minutes the first set was over with a convincing victory against only 11 points. The second set was a little closer but after only giving up 19 points the first match was in the books. After a two-hour break we were back on the court against the Titans Blue. The Titans had just come off a tight match so they were certainly in game shape when the first whistle was blown. The first set score was closer than the play, but we took it with a 25 – 22 win. DA took control of the second set early and cruised to the pool win with a 25 – 19 victory. Peel Selects were our first playoff match of the day, and with the quest for the ultimate medal still on the girls minds and they came out on fire. The set got a little tense at the mid point but the team pulled together and won convincingly against 20 points. The second set left no doubt in anyone’s mind as the girls raised their record to 6 & 0 with a 25 – 15 win. 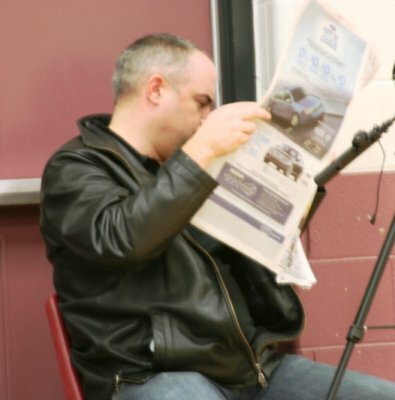 The semi was against our old friends from Ottawa – the Mavericks. The parents like watching this team because in the past there has been as much action on the sidelines as there is on the court. We weren’t sure what was going to happen today but Rob was the favourite to win by TKO in the 3rd round if the coaches got into it. Fortunately the team started on fire and built up a 14 – 0 lead, so there wasn’t much that could be debated about that. After a convincing 25 – 6 win, the parents were happy but some of us were “secretly disappointed” that the benches had an uneventful set. The Mavericks were in the semi final for a reason, and after just being handed their most crushing defeat of the day we knew that they would bounce back in the second set. They certainly bounced back but we were ready for them won somewhat convincingly 25-21. This raised the girls record to 8 & 0 on the day and off to the final we went. The final was against some team from the London area. I’m not sure what their team name was but they wore green jerseys :o. This was by far our best match of the day as far as action goes. There were great rallies throughout both sets with outstanding saves and hits on both sides of the net. Although the outcome wasn’t what we had hoped for it was nice to see how far the team has come this year with their defense and positional play. We lost both sets scoring 9 & 15 points respectively but can hold our heads high with the silver medal finish. The regular season came to an end with multiple medal wins throughout the year capped off with a silver medal podium appearance on the final weekend of the Olympics – how fitting. January 16th was a date the 15U Black team had been looking forward to since the beginning of the season. This would be our first opportunity since last years Provincials to play the best teams from western and southern Ontario. We came into the event seeded fifth but that didn’t concern us in the least. The coaches were fully prepared, the athletes were well rested and ready to play, and the parents were dressed in their DA Fanwear ready to cheer on their favourite team. Our first opponent was the Waterloo Tigers and the girls came out on fire. Every serve was in play, passes and sets were deadly accurate, and hits were made with laser like precision time after time. The first set was over relatively quickly with DA rolling to a 25 – 13 victory. The second set was more of the same with the girls maintaining their focus resulting in the same 25 – 13 outcome. Without a break we stayed on court 4 for our next match. Our next opponent would be Peel Selects who we played very early in the season, so we knew this would be a much tougher match. As expected the first set was a seesaw battle but when push came to shove Attack rose to the occasion and pulled out the first set 25 – 23. The second set continued with the back and forth play, but there is a reason why the Selects were seeded higher than we were and they dug deep and pulled out a 21 – 25 victory. On to a tiebreaker we went and after the team received a revised game plan, they hit the court focused and determined to finish first in pool D. The girls didn’t let themselves down and with their determined play made it clear that they are a force to be reckoned with by rolling to a 15 – 6 match clinching victory. On to the semis we went against the defending Ontario Provincial Champions, Forest City Green from London. We were hoping to meet them in the finals but we were still anxious to test our skills against them, so the sooner the better was fine with us. We weren’t the only ones looking forward to this match because the gym was full of spectators including teams that had already had been eliminated. We went out to an early 7 – 1 lead and all was going to plan when FC called a time out. When play resumed things tightened up and before we knew it Rob was calling a time out with the score tied at 15. With the score tied at 16 we came up against a server who was definitely on her game. With serves that had remote control accuracy and blinding power we dropped nine points in a row and dropped the first set 16 – 25. This seemed to deflate the girls somewhat and they came out a little flat in the second set. Although they rallied throughout the set, they came up short once again falling 20 – 25 in the second set. We may have lost the match of the day but we will learn from it and fully plan on redeeming this loss at our next 15U event. We were now against the Burlington Blaze in the Bronze medal match. The Blaze were seeded third and are known as one of the stronger teams in the west. After our first loss of the day it was time for Rob to put all his teaching and motivational skills to use and refocus the girls so they will be properly prepared to play the Blaze. I’m not sure what Rob said to the team but they were certainly on a mission when they hit the floor against the Blaze. The recent defeat was now a distant memory and if the team from Burlington didn’t know where Durham was they surely have heard of us now. Blaze are a team that is accustomed to bringing home medals but after two sets against the DA 15U girls and only scoring 19 & 15 points respectively, they would have to be satisfied with a fourth place finish. Our trip to Cambridge was a successful outing on all counts. Not only did we win the Bronze, we faced some new teams that pushed us to our limits and we responded very well. This team gets better and better every week and we are starting to peak at just the right time. Everyone is looking forward to our next 15U tournament in February where we can avenge our one loss against our new rivals. “Way ta go” girls you made your coaches and your biggest fans, your parents very proud of you this past weekend. DA 15U Black played in their first 16U tournament of the season on Dec 5th in Mississauga winning a Silver Medal capping off an exciting and fun day. Pool play started against our friends from 15U Storm who had beat us in the semi finals the week prior so although somewhat tight, the girls were looking forward to the rematch. The first set started slow, but it didn’t take long for the team to pull it together and win convincingly 25-11. The second set went back and forth and although we came up short 21-25 we took the match because of the new scoring system. Our next match was against Richmond Hill who were no match for our powerful team. We only gave up 13 and 4 points over the two sets, which propelled us to first place in our pool. Our crossover game was against Orillia and we took the first set 25-16. After scoring 18 straight points early in the second set we rolled to an 25-4 victory putting us into the semi finals against the strong 16U team from North Bay. North Bay is a strong team and rarely let the ball hit the floor on their side of the net. This was by far our most exciting match of the day. After losing the first set 18-25 we were down late in the second set and things weren’t looking promising. In our most exciting finish of this young season we came from behind to pull out a 26-24 victory out of the jaws of defeat. We almost lost a few parents in the process but the girls who now had all the confidence they needed took control of the tiebreaker and finished the job at hand with a decisive 15-8 tiebreaker victory. On to the final we went against …you guessed it Storm 15U. This team reminds me of a bad rash – just when you think it’s gone, it comes back :-). We outscored them in round robin 46-36, but we knew this was a whole new match. Both teams played great and it was certainly an exciting final, but we came up short in both sets scoring 18 points in each. Although disappointed with our first lose of the day, the girls can hold their heads high because they played hard and smart for the entire day and they should be very proud of their silver medal finish. This was a relatively early night compared to last week’s marathon, and we had lots of highlights to remember. Curt was out protecting the residents of Durham (you might want to think about getting an alarm system), so he was unavailable to do lines but we had the next best thing. Another member of Durham’s finest was there to fill in and be the ever-attentive lines person. Good thing we had some back up as well. As usual the food smorgasbord was the envy of the tournament so everyone was well fed. Diane won the 50/50 draw so I’m sure she will be buying Eric something very nice with her windfall. The refereeing must have been better than last week because Rob hardly received any warnings at all and he didn’t even receive a yellow card. I guess the one Sara made him was suffice. And most of all the parents and coach were able to have some fun while being very proud of the athletes. 15U Black played in their first OVA tournament of the year this past weekend at the fabulous new Bill Crothers High School in Unionville. The good news was that the school was local and the facilities were great, but the bad news was that we were sharing the six courts with a boys tournament and we were there a total of fourteen hours. We started the day against the Diamonds and the girls came out focused and executed the game plan only giving up 24 points over the two sets. We were immediately up against the Selects who were seeded one spot lower than us but our game didn’t deteriorate at all as we quickly took the first set 25-13. We may have lost our concentration for a while in the next set because we had trouble finishing the Selects off but we eventually completed the task taking the second set 26-24. This win propelled us to a first place pool finish and a well-deserved lunch break. After a great lunch and very long four+ hour break we were back on the court against the Mavericks from Ottawa. The Mavericks had just come off a victory against our 14U Red team so they had a lot of confidence as they strutted onto the court. Little did they know but there is a club bylaw that clearly states that no opposing club is allowed to beat two DA teams on the same day let alone consecutively (I believe its somewhere in the parent’s handbook). The first set went as expected and although they scored 19 points it was nowhere near as close as the score showed. In the second set we built up an early 12 – 1 lead and then something happened that no one is quite sure what it was. Either our girls were feeling sorry for their girls or maybe they thought they could get some community hours if they let up on them but all of a sudden we were down 12-13. Then came a “questionable” call from the referee which all of the parent referees knew was clearly an error. Coach Rob knows more than we do about the rules, and he knew it was an error as well. In his regular calm manner he advised the ref of his miscall and before we knew it the ref was giving Rob fashion colour tips. He was holding up this yellow card obviously looking to see if yellow brought out the colour of Rob’s eyes. Personally I thought that Rob looked fine, but the ref obviously liked Rob in yellow. Now we were down 12-15 having lost 14 straight points. This woke the girls up and they sailed to a victory knocking Ottawa out of the medal run. The semis were against our friends from Storm. We have had mixed results against Storm over the years and today would be no exception. We were 6 & 0 on the day and so were they – during this match, something was going to have to give. Unfortunately we came out on the short end of the match losing both sets scoring 17 and 21 points respectively. Disappointing for sure, but the girls played a great match and not for a few pivotal points it could have gone the other way. 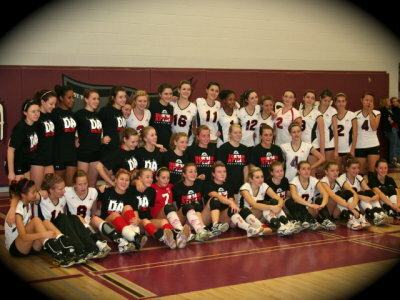 On to the Bronze medal match we went against our Durham rivals DRVC. The girls definitely wanted this match with a passion and it showed. The tightness from the semis was long gone and everyone came out loose and having lots of fun. Not only did they want this game for themselves, they definitely wanted to give Brianna a welcome to DA present. No one was disappointed and although the second set was really close it was an exciting way to finish off the day. A straight set victory against 21 & 23 points sending DRVC home in 4th place while winning the Bronze capped of an exciting day. The coaching team did their regular great job adapting to the game situations and the parents were great support with their loud cheering and great encouragement. Curt, April, Stephen and Steve did a great job representing the team by scoring our assigned matches and we were all proud of the team during a very long day of great play. We have a lot of tournaments left to play this season and if this one is any indication, it’s going to be a great year. After a quick chorus of Happy Birthday to Camille, it was home for a well deserved rest……until next weekend. 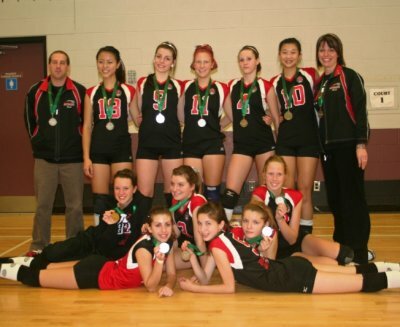 Darryl Reid organized a friendly round robin tournament on November 14th and was kind enough to invite our 15U girls. With 35% of the team being new, this was a great opportunity to play some competitive volleyball prior to our first OVA tournament. Our first match was against the 17 U Black team and the girls came out on fire. There were lots of great passes, accurate sets and hard rally ending spikes. The girls played great position ball and took the first set 25 – 17. It was almost like they listened during all the practices and did what Rob has been telling them to do. Maybe we can get Rob to tell them to clean up their rooms and do the dishes – ya right. We continued our good play in the second set, but 17U Black elevated their game and took the set 25 – 23. After a two hour break and some food we were back on the court against 16U Black. Although we played well we had a slow start and fell behind early. We got it together as the game went on but came up short in the first set falling 18 – 25 to the 16 Black girls. The second set was much closer and we actually had a few chances late in the game to take the set, but fell 24 – 26. Our girls may have lost both sets but it was clear we are a team to reckon with. Rob had a talk with the girls, and I don’t know what he said but when they hit the court against the 16U Red girls they were on a mission. They were focused, ready to play and executed almost flawlessly. The first set finished with a 25 – 9 victory followed by a 25 – 13 tournament ending win. The girls finished with three wins and three loses but more importantly they executed the game plan and worked together playing some great volleyball. It was a pleasure to watch the team and all of the parents were proud of the athletes. There were other great things that happened during the day besides the phenomenal volleyball. Curt made more correct calls than wrong ones which was nice to see. Its too bad Jill missed it. The food buffet rivaled even The Star Walk Buffet so everyone was well fed. The new parents got to know the returning parents a little better (it will be interesting to see if they come back). And last but certainly not the least we were able to see the beginning of a team that will continue to improve and will be feared by many teams throughout the upcoming season. Here is our first team to submit a team picture for the 2009-2010 season.